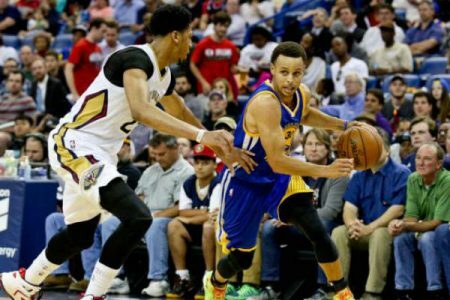 Saturday’s NBA Playoff card features a Western Conference match-up as the Golden State Warriors (70-15, 47-37-1 ATS) and the New Orleans Pelicans (45-40, 48-37 ATS) will clash at Smoothie King Center in New Orleans. Tip-off is scheduled for 8:00PM EST and the Golden State Warriors are coming in as a favorite by 7 points with the total set at 205 points. The Warriors claimed both meetings home in Oakland and won 123-119 in OT here at New Orleans Thursday as they managed to make up 20 points in the fourth quarter to force overtime. Stephen Curry led the team with 40 points and nine assists and was 7-for-18 from behind the arc while Klay Thompson shipped in 28 points. The team shot only 40.4% from the floor though which can be compared to the Pelicans who were far more effective completing 51.1% of their field-goal attempts. Anthony Davis had another stellar performance with 29 points and 15 rebounds while Ryan Anderson came off the bench and had 26 points, shooting 10-for-14 from the field. The Warriors came into last game as a five points favorite and are now 0-6 ATS in their last six games overall. They’re 0-7 ATS in their last 7 following a S.U. win and 0-5 ATS in their last 5 games following a ATS loss. The Pelicans meanwhile are 6-0 ATS in their last 6 home games and 5-1 ATS in their last 6 games following a S.U. loss. As if those trends have not convinced you keep in mind that the Warriors are0-4 ATS in the last 4 meetings with the Pelicans and 1-3-1 ATS in the last 5 meetings in New Orleans.